A young professional living in NYC has made it a second career of experiencing every possible food possibility that she can! If you love a good burger, this is the place to go. Island Burger, in Hell’s Kitchen, has a menu the size of 39 inch flat screen TV (ok maybe not that large but you’ll see once you go) with every possible burger combination you could ever imagine. The atmosphere of the restaurant fits perfectly with the food they serve. There is a small bar with craft beers on tap and the walls are covered with exposed brick with one wall covered by a giant chalkboard. It’s small yet you don’t fee cramped. We sat at the bar and immediately ordered chips and chili. YUM. We devoured it in seconds. Then it was on to chili cheese fries and our burgers. 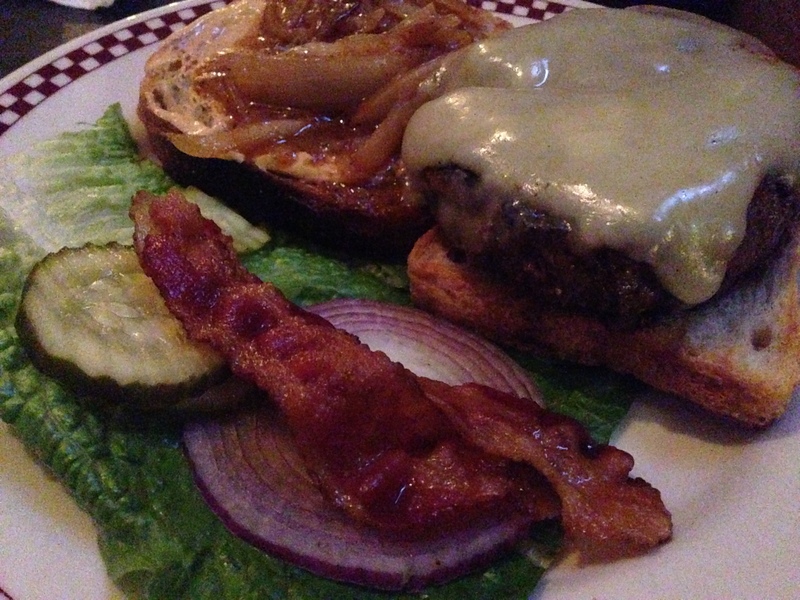 I opted for the Bourbon Street–a blackened burger with bacon, jack, bayou mayo, and sauteed onions on sourdough bread. I would never think to have a burger on sourdough but let me just tell you it worked. Despite my burger being the size of my face, it didn’t stop me from devouring the entire thing. If you’re ever craving a burger, you need to visit Island Burgers (and if you’re feeling to lazy to leave your apartment, they deliver! *probably something I was better off not knowing). But until next time, keep eating! Okay so now that I live in NYC, the mecca for restaurants, it’s time for me to venture out and explore the food world this city has to offer. First stop: Shake Shack. While this is a bit predictable, I felt it was a must. I’ve been dying to try this for quite some time and last night presented the perfect opportunity (and a little “persuading” from my coworker). I was trying to contain my excitement as my coworker and I walked to Madison Square Park but caved when I saw the twinkling lights and infamous ‘shack.’ We practically dashed to the line (and while it was long it was so worth the wait). I had plenty of time to decide what I wanted to order. 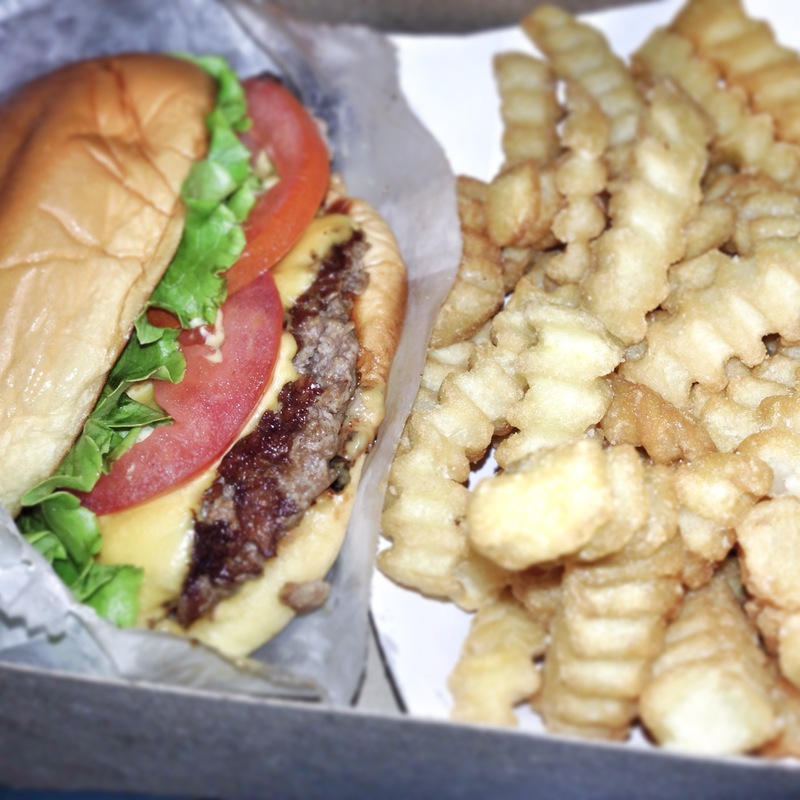 Final decision: The ShackBurger and fries. Best decision I had made all day. First of all, the shack secret sauce was absolutely incredible–although I wish there had been more–and combined with the flavorful, juicy burger it was simply out of this world. After I took the first bite of that burger I was wondering how my meal could get any better until I tasted the fries. They were crinkle fries, my ABSOLUTE favorite type of fries in the world. That automatically made them ten times better. It was the combination of crisp and grease that won me over. I can not begin to tell you how fast I consumed this meal. I might have even set a new record for myself for ‘fastest time a meal was consumed.’ I was a happy camper. It’s safe to say that I will be making Shake Shack a regular stop during the week. I need to give a big shout out to my coworker Rebecca for taking me. If anybody has any recommendations on restaurants in the NYC area–please, please, please let me know! But until next time, keep eating! I seem to be in a throwback kind of mood this week and it got me thinking about all the food I’ve had over my four years at Boston–most of it amazing, but some of it that’s just god-awful (and leaves me wondering ‘what was I thinking??’). So here it goes. The college experience wouldn’t be the same if no one gained weight–it’s just a fact of life. While most people gain the ‘freshman fifteen,’ I seemed to also pile on the ‘sophomore seven‘. How does this happen? It’s simple, really. Take carb-heavy dining hall food (“sure, I’ll have more mashed potatoes and maybe a side of fries…”) and combine it with the Junk Food Wonderland that becomes part of daily existence. I must have thought that never having unlimited pizza at home justified me eating about 5 slices… I ate everything from Easy Mac, to ice cream sandwiches, to Lays, an endless amount of Dominos pizza, and quite sadly the list goes on and on. Somebody was either ordering, bringing in, going out for or in the mood for something greasy, salty, fatty or just plain BAD. And talk about a group dynamic—all it takes is two people and suddenly, you’re outnumbered. The idea of a salad or a turkey sandwich disappears instantly, to be replaced by a cheddar-bacon-triple-stacked Gutbuster burger and a side of fries. Now that I have my own apartment my junk food days are behind me (or at least I tell myself that….I caved and had KFC the other week), and I have switched to a more balanced and healthier diet. While I have to admit I do get lazy and end up making frozen food, I couldn’t imagine my life if I had to rely on the dining hall for all my meals. But that’s not to say I don’t splurge and get the greasiest food known to mankind once in a while, it would be a lie if I said I didn’t. And as a bonus, I do have to say eating better has helped me drop the unwanted pounds (that, and about a zillion steps on the elliptical….). So I hope you all take the time to splurge once a while and get that greasy burger with a side of fries (that I know you all secretly want, even if you don’t admit to it)–no one is going to judge you 🙂 But until next time, keep eating!